Cliff Swallows like to do everything together. Like a gaggle of seventh-grade girls, they travel together, eat together, roost together, and dress alike. 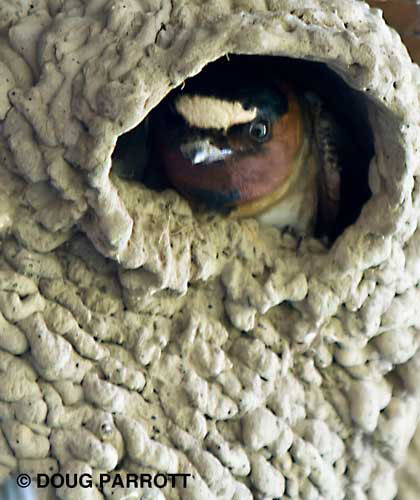 This year, Cliff Swallows arrived at the Fill from their homes in South America on April 4. One day, no swallows; the next, sky filled with them. They congregated mostly on the western side of the Fill, not too far from their mud nests plastered under the eaves of the IMA Building. There, they checked out the old nests, many of which had been scraped off by the maintenance staff, who seem to prefer bare walls to bird condos. Undeterred, the Cliff Swallows flew over to Main Pond to collect mud to repair the old nests and construct some new ones. As they renovated the colony, they took their lunch breaks together, naturally, flying around Canoe Island, where the insects breed abundantly in the cattails and still waters. Every morning during nesting season, I walked over to say hello. Cliff Swallows are early risers, like me, and the rising sun would find them already out and about. Last week, though, the colony was deserted. Ah, I thought, moving day. Sure enough, the colony had moved itself to a little tree growing in the center of Canoe Island. The nestlings had fledged, and parents and kids were now all clutching branches on that tree, waiting for the insects to warm up and begin flying. I counted more than 200 birds packed into a tree not much bigger than an SUV. Everyone was chattering at once. Cliff Swallows are small birds with small voices, so I was surprised at the decibels they generated when in chorus. From a distance, they sounded like a flock of blackbirds. In fact, I thought the noise was the raucous Red-winged Blackbirds, who also hang out on Canoe Island. After I realized the cacophony was caused by the Cliff Swallows, I tried to analyze how many swallows it takes to duplicate the raucousity of one blackbird. Scientists will be pleased to know the ratio is 14:1. For the next several days, the Cliff Swallows will continue to hunt insects together, building up strength and fat for the long journey south. Last year at this time, the flock decided to patronize Main Pond. I think the protected waters of the pond attracted them. Swallows drink on the wing, so it’s helpful to find waveless water. To take a drink, they skim over the water, flying closer and closer to the surface. Then all at once, they fold their wings back, put their heads down, and take a tiny sip on the fly. It takes a lot of skill to drink on the wing like this ­­– the juveniles tend to misjudge at first and make a mighty splash instead of a delicate ripple. You should keep an eye out to see this lovely phenomenon of nature because it won’t keep happening for long. One night soon, the swallows will sense conditions are right. They will rise into the night sky together, circle their summer home a time or two, and wing their way south. I will miss them when they’re gone. This entry was posted in Uncategorized on July 29, 2010 by constancesidles.